The White Castle/X-Men: Apocalypse Sweepstakes is open only to legal residents of the fifty (50) United States (and the District of Columbia), including military personnel stationed overseas, eighteen (18) years old and older. 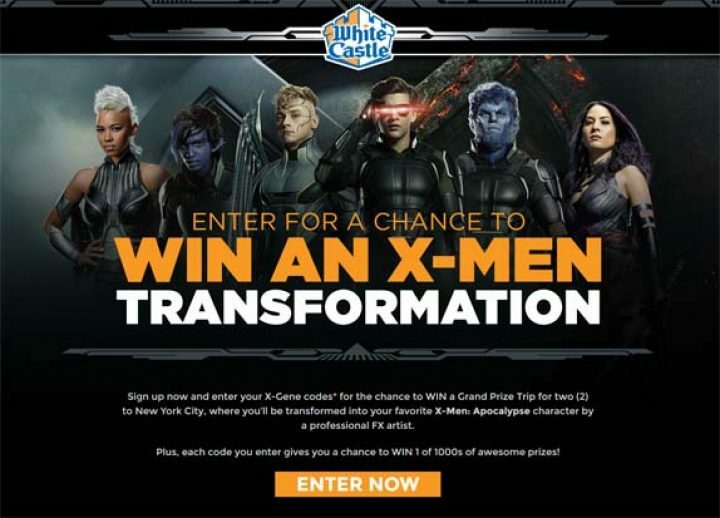 The White Castle/X-Men: Apocalypse Sweepstakes ends on December 31 at 11:59 p.m. ET. You will need a code to participate. You may obtain Codes only during the designated collection periods. There are some prizes that require Restaurant only Codes, some prizes that require Retailer only Codes, and some that allow both types of Codes. Purchase a specially-marked six (6) pack cheeseburger or hamburger box from participating retailers: During the Retailer Code Collection Period, purchase a specially marked six (6) pack cheeseburger or hamburger box from participating retailers and you will receive a game piece that includes the Promotion URL and a code, while supplies last. Purchase a specially-marked medium or large soft drink from participating restaurants: During the Restaurant Code Collection Period, purchase a specially-marked medium or large soft drink from participating Restaurants and you will receive a game piece that includes the Promotion URL and a code, while supplies last. Once you have a Code, visit whitecastlesweeps.com and follow the links and instructions to complete and submit the registration form. Each entrant may request and/or use up to two (2) Codes per day. ONE (1) GRAND PRIZE: A trip for two (2) to New York City, NY; and while in New York City, NY, an opportunity for either the winner or winner’s guest to be transformed by a special effects artist into winner or Companion’s favorite X-Men: Apocalypse character and will be professionally photographed during the special effects session. Trip package consists of: round trip, coach-class air transportation for two (2) from a major airport near winner’s home to one (1) of the major airports that services the New York City, New York area (departure and arrival airports determined by Sponsor in its sole discretion); three (3) nights’ accommodations at a hotel determined by Sponsor in its sole discretion; and ground transportation to and from destination airport and hotel. Approximate Retail Value (“ARV”): $3,000. FIVE (5) FIRST PRIZES (Restaurant Prize Pool ONLY): $100 White Castle gift card. ARV: $100. FIVE (5) SECOND PRIZES: X-Men: Apocalypse laser keyboard and USB. ARV: $70. TWO HUNDRED FORTY-FIVE (245) THIRD PRIZES (Restaurant Prize Pool ONLY): $25 White Castle gift card. ARV: $25. TWO HUNDRED FIFTY (250) FOURTH PRIZES (Restaurant Prize Pool ONLY): A crave case of original sliders. ARV: $21.60. TWO HUNDRED FIFTY (250) FIFTH PRIZES: X-Men: Apocalypse hat. ARV: $20. TWO HUNDRED FIFTY (250) SIXTH PRIZES: X-Men: Apocalypse notebook. ARV: $10. TWO HUNDRED FIFTY (250) SEVENTH PRIZES: X-Men: Apocalypse poster. ARV: $10. ONE THOUSAND (1,000) EIGHTH PRIZES (Restaurant Prize Pool ONLY): A 10 sack of original sliders. ARV: $7. TWO HUNDRED FIFTY (250) NINTH PRIZES: White Castle mug. ARV: $5.99. TWO HUNDRED FIFTY (250) TENTH PRIZES (Retailer Prize Pool ONLY): A $5 off coupon towards the purchase of any White Castle 6 pack in retail outlets. ARV: $5. ONE THOUSAND (1,000) ELEVENTH PRIZES (Restaurant Prize Pool ONLY): $5 White Castle promo card that can be used for any purchase at White Castle restaurant. ARV: $5. TWO HUNDRED FIFTY (250) TWELFTH PRIZES: White Castle 95th glass. ARV: $1.95. ONE THOUSAND (1,000) THIRTEENTH PRIZES (Retailer Prize Pool ONLY): $1 off any 6-pack of White Castle cheeseburgers or hamburgers. TOTAL ARV OF ALL PRIZES: $40,610. First time entering. Lets go. what kind of comments can I make and I’m entering for the first time.